The photograph above was taken in 1996. 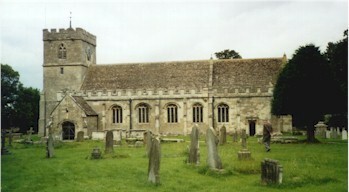 A church has been on the site since the 11th Century. Remnants of this church survive; for example parts of the tower have embedded in the walls fragments of Roman tile. Improvements and extensions were carried out over the years. The south aisle and porch were added in the 14th century, with a row of arches between the main body of the church and the aisle. At some time before the early 19th century galleries were inserted, with outside steps to the galleries. Work in 1823 removed the 14th century aisles and repitched the roof, making the interior one large open space surrounded by galleries. Major restoration was undertaken in 1876, transforming the church into Victorian Gothic style, with a high altar and choir stalls, the latter reputed to have been designed by the Rector, John Gibson. The Organ case, installed in 1876 and upgraded in 1895 was by Thomas Liddiatt, a carpenter, who went on to found an organ building business in Leonard Stanley. The nave altar contains within it a medieval oak chest, inscribed on the lid TC, Thomas Clutterbuck. The chest was probably made whilst he was churchwarden. The square stone font is dated 1877 and consists of a square stone bowl with marble panels. Historic Towns in Gloucestershire, Roger Leech. 1981. Gloucestershire Notes and Queries, Volume 5, 1891-3. The sketch and description of chest are from page 456. The sketch and description of the stocks are from page 306. Sketches of the Court house and Peck Street House are from pages 383 and 401. Birmingham City Archives, Central Library, Chamberlain Square, Birmingham B3 3HQ, hold Liddlatt & Sons, organ builders, Leonard Stanley (Glos): account books 1919-40 (MS 1969). Did you start reading about my ancestors and wish to continue, or would like to read the whole story? Click here. To find out how an ancestor was involved in a fatal accident in the church click here.